The National Cynical Network is California's Phineas Narco, the man behind the "found sound radio" program, "Plundercast," which can be heard online Tuesdays, from Midnight to 3am (EST), and Fridays at 10PM, on The Sensory Research Network. The program is a live streaming audio broadcast featuring many of the artists associated with the Snuggles Collective, a group of DJs, composers and audio artists who met through a Negativland Fan Club of the same name. 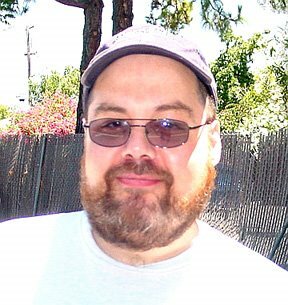 Phineas Narco has been involved with quite a few projects, including "Midnight Voicejail," which was a creative audio documentary focusing on a voicemail "Box Scene" which started in Silicon Valley in the mid 1980's. He's also a solo sound collage artist, and was featured on 2000's Droplift Project CD. *Name: "The National Cynical Network"
*Do you use a pseudonym? Yes. Phineas Narco. *Members: Used to be 3. Now it's just me, and the occasional friend or contributor who comes along. *Founding Members: Phineas Narco (myself), Alexander T. Newport and Ronald Redball. *Tape manipulations, digital deconstructions or turntable creations: 'Digital Deconstructions' I think fits best right now. *Another genre descriptor: Yeah, 'Mediage' was a term I coined (making me a 'Mediagician' I suppose), but I don't use that term much. I tend to just use 'sound collage' to describe what I mainly 'do' when people ask, like at parties. That seems to be the most accessible term for people cuz they're usually already familiar with the term 'collage' in the visual sense of that medium. After asking what I do, people will sometimes kind of frown, scratch their heads and say 'do you make much money doing 'sound collage?' And the answer is 'No.' This confuses them even more. *Is there a story behind your name? 'Phineas Narco': Both names are from Greek mythology. 'Narco' is a shortened surname version of 'Narcissus' cuz I tend to be kind of a self-absorbed guy, I think. So I put those names together to describe how I saw myself. Incidentally, I never intended 'Narco' to refer to 'drugs.' Some people make that assumption. Friends call me 'Phinny.' 'The National Cynical Network' name was thought up by Ronald Redball and was originally the name of one of the 'Over the Edge' shows that Ronald did with Don Joyce and Al Newport. 'NCN' is also a bit of a goof on or, mix-up of, 'CNN' which one of the logos reflects. (Please don't sue us). *Location: 'We' are from Silicon Valley, California (San Jose and its immediate environs). *Original Location: Oddly enough, all three of the original members are from around the Michigan/Ohio area of the Midwest before our respective families moved to California when we were all kids. We all met when we were in our 20's through our association with the Negativland 'Over the Edge' radio show. *What is your creative/artistic background: In the 70's, as an easily bored teen raised on TV and movies, I was already into capturing and playing with media. I used to bring portable tape recorders into theaters and drive-ins to record the movie sounds to listen to later. I would make mix tapes for friends. I'd tape the TV sound too, pre-VCR. I was interested in putting together paintings, models, dioramas and puzzles as a kid. I'm self-taught in terms of editing and mixing audio but I took 2 or 3 courses in art and 'art appreciation' at local colleges many years ago when I flirted with higher education. In the mid-eighties, I fashioned my own mixer (not knowing what a mixer was) by connecting a couple VCR's and a stereo tape deck and did sound experiments. I frequently called into the Subgenius and Negativland radio shows on KPFA to talk and inject material into their live mixes. I met Don Joyce in 1987 and have done maybe a dozen shows with him since then. (I will be on 'Over the Edge' on the last show of July, 2008 btw!). Starting in 1998, I spent a few years at KFJC (Foothill College's Radio Station, in Los Altos Hills, CA) where I put together a somewhat weekly feature called 'Midnight Voicejail.' The show was about a real voicemail community in the 80's in Silicon Valley and gained some media attention at the time. Ronald and I had a cut on the secretly famous CD 'The Droplift Project.' A piece called 'Free Will' which got some college radio play. Since that time, I've done a series called 'Needle in the Red' and nowadays I do Plundercast on The Sensory Research Network, which I webcast live Tuesday nights at 12am and Friday nights at 10pm (all times EST). *History: I put the formation date at 4/20/98, so this month (April, 2008) is our 10th Anniversary. *Born: I am a 'Barely Boomer' just barely being in the Boomer generation by a week or two (by some calculations of it's span). Al is a year or two older than me, Ronald is 2 or 3 years younger than I am. All originally from the Midwest. Al now lives in the UK, and is married and writes books. Ronald is probably somewhere in Cupertino, CA. He and I have not been in contact for several years. *Motivations: I have to do something that's interesting and stimulating, for me, or else I get horribly depressed, so it's largely a form of occupational therapy you could say. I'm also motivated by a need for self-expression and the evasion of boredom. I really want to create something so beautiful that people will not want to destroy it just because it's legal status is a bit dubious. *Philosophy: I don't think it really has a definite philosophy or ideology other than maybe 'No Ideology or Philosophy'. It's all over the map. And that's okay. It doesn't like to be pinned down, so I don't try. I really just aim for creating programs that I find personally interesting and wonderful, and that I like to listen to. And then people 'out there' can decide, from that pool, what they find interesting and wonderful, and I'll promote that. The work has had it's 'dark and loopy' periods, but I am now aiming at pulling something humorous and sincerely uplifting from all the cynicism and bleakness. So that's kind of where it's at now. *How would you like to be remembered: 'Fondly', I suspect. But I'll be dead too, so it won't matter. Or else, if I'm coming back as someone else, I hope I am able to discover my work, in the next life, and continue to listen to it. Then I could remember myself fondly. That would be nice. 'Fondly', I suspect. But I'll be dead too, so it won't matter.